Gene therapy, otherwise known as human gene transfer or genome editing, is a cutting edge medical procedure to resolve a genetic disorder at its source. By manually altering the condition of a defective gene (by replacing, adding, or removing parts of DNA), this therapeutic procedure is able to repair defective tissues and organ. Unlike conventional drug-based treatments, gene therapy treats the underlying issue at its source rather than treating the symptoms. Gene therapy is a highly controversial subject, as it is considered a pathway to editing human embryo cells, and consequently, designer babies. After much deliberation, the British government finally allowed gene therapy to be performed in Britain. However, it is currently limited to just three types of therapy which have been approved (after extensive research and testing) by the American Federal and Drug Administration. Two of the therapies are for cancer, while the third one is for inherited vision loss. The cost of these treatments can cost as much as $1.5 million (£1.17 million) a year. How is gene therapy performed? 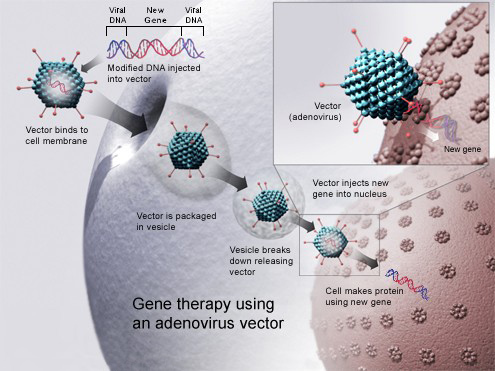 Theoretically, gene therapy uses a live vector, such as a recombinant virus or naked DNA, to transport the modified gene to the cells in the damaged area. Once delivery has been completed, the gene will relay new protein and RNA building instructions to the cells. After the new molecules are produced, they will then replace the existing damaged cells. Once this is done, the defective organ or tissues will permanently heal. While this sounds great in theory, it is so much more completely in practice. The addition of a gene into a foreign body could trigger a domino-like chain effect which could create a host of new problems. This is why so much research is needed for gene therapy. In the case of Luxturna, one of the three gene therapies approved by the FDA, the gene insertion via subretinal injection must be performed six days apart for each eye. NSAIDs such as prednisone are then prescribed to patients to limit any potential adverse reaction by their body against the inserted DNA. Gene therapy is poised to revolutionise medicine. There are currently 1,500 known diseases which are caused by single defective genes. With sufficient research, these diseases, such as hereditary blindness and heart diseases, could be permanently cured. Some have likened the current gene therapy landscape to the early days of organ transplantation, where the risks of fatality and complications were enormously high. However, in a couple of decades, gene therapy could be as common as kidney transplants. In fact, with gene therapy, hereditary kidney failures could be eradicated completely! Diseases can be literally cured as soon as they are detected. With the growth of private DNA testing, common folks might even start testing their children from a young age to plan for the future. As far as the costs are concerned, the numbers will significantly drop once a critical level of participation is achieved.